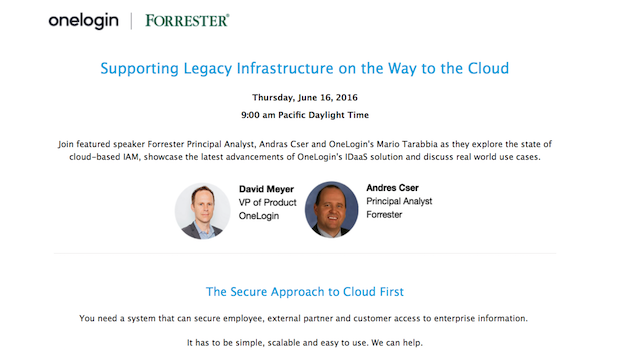 Join featured speaker Forrester Principal Analyst Andras Cser and OneLogin VP Product David Meyer as they discuss how to protect legacy investments, while securely expanding cloud application portfolios and extending identity management to devices. Despite the rapid enterprise adoption of SaaS, many organizations still rely on a hybrid mix of on-premise and SaaS apps to run their business, creating administrative challenges and inefficiencies. Identity-as-a-service (IDaaS) solutions have evolved to provide business and security professionals with a viable and compelling alternative to traditional IAM options. Besides delivering all the great cloud benefits, cloud-based IAM offerings can integrate with on-premise environments to increase business agility, reduce operational inefficiencies, mitigate identity risks, and improve real-time visibility for today's hybrid enterprise. These five challenges roll up into a larger one - the cost to create a holistic, comprehensive security solution focused on people. Saviynt and OneLogin’s partnership combines our individual expertise to create a unified, coordinated user access and governance solution with fine-grained entitlements that ease identity security burdens facing the hybrid enterprise. So, join us for this webinar to learn how to remediate these 5 complex challenges with a simple and unified solution from Saviynt and OneLogin. Can’t make it to the webinar? Register anyway, and we’ll send you a link to the on-demand recording once available. The list of assets privileged users need to access is ever-expanding in today’s hybrid organizations - infrastructure, internal applications and systems, cloud SaaS apps. These super users are often the main targets for spear-phishing attacks and man-in-the middle hacks, so consolidating and making that access more secure by eliminating passwords and exposed credentials is a critical best practice. Alongside privileged admins, a company’s workforce also needs to strike a balance between productivity and security. If IT can’t manage across all user groups, it doesn’t take long before employees start circumventing IT control and Shadow IT and side channels proliferate, multiplying an organization’s cyber risk exponentially. In the world of identity and access management (IAM), integration and alignment of core security controls across privileged and non-privileged users is imperative. Tune in to this webinar to help get on the right track. Single Sign-On helps companies be more productive, and save both time and money. Tune in to find out how. This webinar is to give our partners quarterly updates about OneLogin Accelerate, partner program including active incentive programs, new sales plays and other program updates. Companies are moving to the cloud to compete more effectively and employees are using an increasing number of SaaS cloud applications. Unfortunately, these apps come with hidden risks and vulnerabilities when IT is not involved in securing and managing them. This issue is known as Shadow IT. We will be showing a live demo of Cloud Risk Assessment Tool and walk you through a real customer case study. So, join our two cloud security experts, Omar Zarabi CEO & Founder of Port53 Technologies, and Nathan Chan Sr SE at OneLogin on April 24th 10am PT for this webinar. While compromised credentials cause 81% of data breaches, identity and access management spend represents only 8.5% of security budgets. With recent developments in the digital identity space, IT and security leaders have an opportunity to evolve from the “business enablement vs. security” discussion and consolidate on a new generation of tools to serve both purposes, maximizing the impact of their investments, and reducing their operational workload along the way. You’re invited to an exclusive, OneLogin customer-only webinar that gives a sneak peak into the future of work, 2019 market trends and what you and your company can expect from OneLogin in 2019 and beyond. What does the future of work look like and how does security and access management fit into this bigger vision? How will OneLogin provide the right tools to support the changing workforce at your company? Tune into this special webinar to learn the workplace changes predicted by CIOs from around the world and how OneLogin is evolving to support this rapidly approaching future. This webinar will be hosted by OneLogin’s Chief Executive Officer, Brad Brooks and Chief Product Officer, Venkat Sathyamurthy on March 19, 2019 at 11am PST/2pm EST. The volume, complexity, and pace of all the critical elements of business are undeniably increasing. The question is not whether or not commerce will undergo a dramatic transformation in the coming years, but what - precisely - that transformation will look like, what new opportunities it will present, and - most importantly - what yet-to-be-foreseen challenges will emerge. Operating and managing applications in both on-prem and cloud environments isn’t an easy task. And it’s getting even more complicated as the scale of deployment increases and expands globally. So, join us for this webinar to learn how to better manage your hybrid environment. -Streamline the management of your on-prem and cloud environments. -Reduce the time and cost required to support your hybrid environment. -Use solutions that enable your organization to scale by making it easy to manage, control and provide appropriate access for all end-users. Can’t make it to the webinar? Register anyway, and we’ll send you a link to the on-demand recording, once it’s available. Learn how to integrate your HRIS and Identity Management platform to streamline onboarding and offboarding, automate user management and drive efficiency. Hear how a small IT and HR team at Stitch Fix collaborated to design and implement a best of breed solution with Workday HCM and OneLogin in a highly complex, fast-growth environment with thousands of remote and seasonal users while saving hundreds of thousands of dollars per year. Come learn about the new features and enhancements included in the OneLogin Winter ‘19 Product Release! In this release, we will highlight key features and functionality support your hybrid (on-prem and cloud) environments. Our product managers are looking forward to the opportunity to interact with you. Bring feedback, and be heard! Are you looking to strengthen identity governance and risk management for compliance initiatives like GDPR? Or to automate enterprise access management? Today’s enterprises handle a growing volume of unique identities and applications and the process is only getting more complex. The combination of complex web of identities and manual workflows for application provisioning, compliance reporting, and access fulfillment, leads to massive inefficiencies and potential risk. With Clear Skye and OneLogin, ServiceNow customers achieve a single system of record for all enterprise identities and access management. Additionally, the joint solution integrates seamlessly with ServiceNow GRC and provides evidence for auditing and IT compliance. Join us on Wednesday, Aug 29th at 10 am PST to hear from security experts from OneLogin and Clear Skye on how to automate identity orchestration for enhanced security and compliance on ServiceNow. Innovative Identity Management Solution That Actually Makes Life Easier. Empower employees, customers and partners with secure access to your cloud and company apps on any device. Transform your enterprise security and centralize control of users, apps and devices.